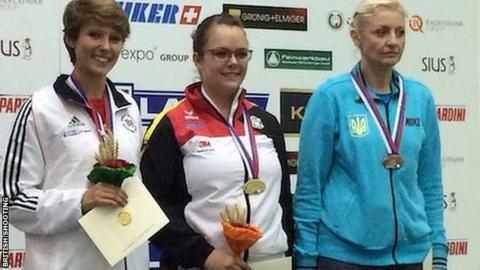 Britain's Hannah Pugsley won her second silver medal at the European Shooting Championships in Slovenia. The 23-year-old set a British record 577 in the 300m three-position rifle, but missed out on gold once again to Germany's Lisa Muller. Muller beat Pugsley in a tie-break in the 300m prone rifle on Monday. Pugsley said: "I came off the firing point and honestly didn't think I'd done enough, but my name kept creeping up the leaderboard." She shot a 196/200 in kneeling, 200/200 in prone and 181/200 in standing in Maribor, but admitted she was upset with a "below-par" display in the standing. "I think I could have done more," added Pugsley. "But on reflection it looks as though everybody had a difficult time in standing. "It may have been the weather conditions that caused that because the wind can come from the side, the back and the front on this range."